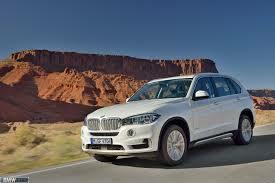 2014 BMW X5 Review- Is It Still The Same Script? When BMW thought to update the X5 for 2014, their heart was not set on redesigning what is essentially a great luxury crossover. After all, why fix something that is not broken? This explains why the styling of the SUV has mostly remained the same. With the exception of the different grille and lights design, it is still the familiar X5. It is bigger though, its trivial weight loss notwithstanding. Overall, it is a big fancy car, and while its exterior design might underwhelm those whose expectations were set high, it is consistent with the design language the company has stuck to. The new X5 will come in a variety of powertrains. The monster among them is the 4.4L V8; with a satisfying pull of 450hp. All the others are 3.0l inline sixes, with a turbocharged diesel and petrol all being options. The cabin of the 2014 X5 is considerably bigger and there is more cargo space as well. Second row passengers get just enough legroom space, and you get a new seat configuration. These seats can be folded to increase cargo room, if the need arises. There’s a third row seat option, but it’s nothing to marvel about since it is impractical for adults. The interior is well designed, with the use of darker tones and quality materials being enough to distract from its familiarity. A large vibrant display sits at the very center making it easy to control the iDrive system. There are plenty of driving modes to keep the driver entertained. Eco Pro complements the electronic steering by adjusting the shift and the throttle as necessary. Steering is not as smooth as would have been desired, but it’s not bad either. The X5 handles competently on the road, with virtues such as sharp steering easily becoming evident. Its off-road skills are unquestionable. When the sport mode is activated, the ride becomes somewhat stiff as the suspension firms up. Each of the powertrains provides enough pulling power to get the X5 going. The standard 3.0l inline six feels inadequate at times. The tri-turbo 3.0l inline six diesel is the best. The eight speed automatic works well, and the throttle response is immediate. The driving experience pales when compared to say, the Range Rover Sport. The rigid steering and the complicated suspension set up make the 2014 X5 feel rather anxious on the road. It is not as relaxed or as confident as the aforementioned example. The 2014 version of the X5 is not perfect. It is an improvement from the previous model, but there are still boxes left unchecked. The best features are only available in the higher trim levels and the standard 3.0l inline-six is only just adequate. But even with these shortfalls, the X5 feels like it is coming of age. It is a contender in the luxury crossover segment and is successful sales history demonstrates how many people it has fascinated. If your close family insists that we want any car, the 2014 X5 will be a great fit. What are the top 3 superminis for young drivers?